One of my favorite things about elementary school, besides the fact that the paste in the ’70s tasted like mint, was getting the Scholastic book order forms. I would pore over the catalog, optimistically marking a dozen books. My parents would wheedle me down to two or three favorites, and then, we would wait. Book order day was like having Christmas in the classroom. Nothing smells quite like a new book — scented with just-dried ink and a whiff of adventure. As a teacher, I still love the Scholastic order forms. My students can’t all afford to buy books, but every month, Scholastic catalogs offer a $1 book, and I always buy a class set so we can explore a new book together. This month, I was especially excited to get a catalog featuring just books on math and science. Girls who like math are nerds. Girls who twirl batons are ditzy! Because, you know, the way we need to market science and math to girls is by offering not an experiment kit or a calculator, but two sparkly “BFF” necklaces. And the girl who is into math is a “nerd,” while the girl who twirls batons is a “ditz.” Because apparently smart girls are unattractive nerds and pretty girls are stupid. The catalog offers plenty of great books to stir interest in STEM for boys and girls. I’ll still spend way more money than I should, and I will still think “new book day,” is the best day of the month. 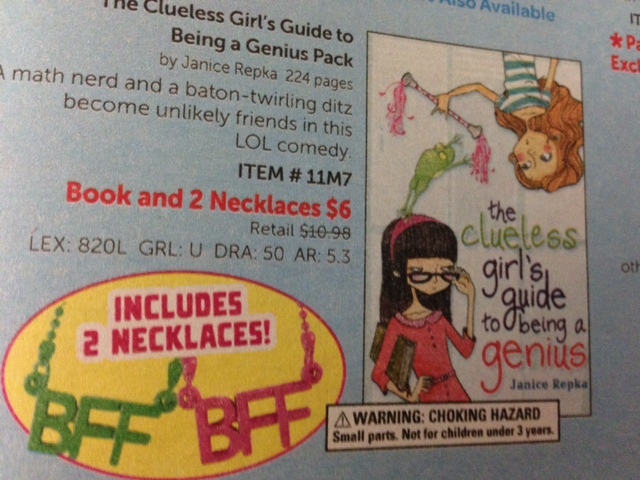 But Scholastic, if we’re going to be BFFs, maybe you need to read “The Clueless Publishing House’s Guide to Being a Genius,” and give girls something challenging to wrap their brains around instead of something sparkly to wrap around their necks.